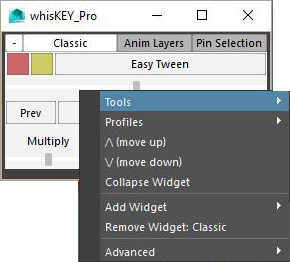 The WhisKEY Pro Toolkit is an Animator’s swiss army knife of animation tools. Faster and completely rebuilt from the ground up to help assist in day to day animation tasks. Many widgets to choose from. Lots of workflow and cleanup tools. 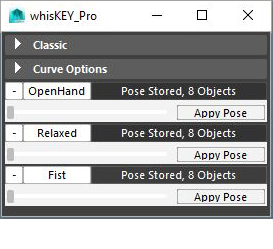 There are a few tips that will help you get the most out of WhisKey Pro. 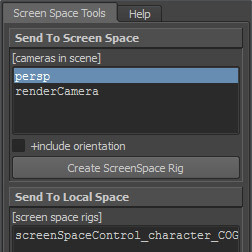 Settings for the tool are stored in a prefs file outside of Maya. The really cool thing about this, is that if you store a pose, or create a customization, it will be available in your other Maya sessions. This is great for people like me that have 5 Maya’s running most of the time. Many of the sliders and tools will look to see what channels you have selected. So keep this in mind when you’re working with WhisKEY Pro. Ill be adding new Widgets, so please let me know if you have any requests! 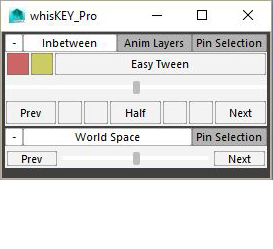 Save “ebLabs_whisKEY.py” to your maya/scripts/eblabs folder. 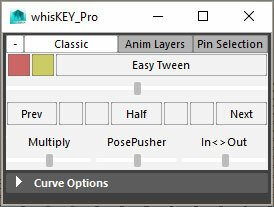 This widget is based on the original WhisKEY Tool layout. For convenience this widget combines both the Inbetween Widget and Extras Widget. **Note: Sliders will use selected channels as well. Use this to affect an individual layer, or to create inbetweens based on the cumulative values of all layers (this is default). These buttons will allow you to set keys on your selection, or the pinned objects. 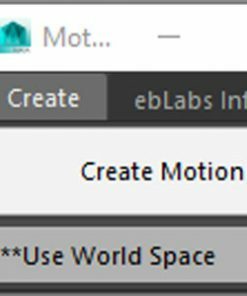 The green button sets a regular key, but it will be colored green or whatever color you have set for the Special Key Color in your Maya Color Preferences. ** Note: Right click for some keying options. 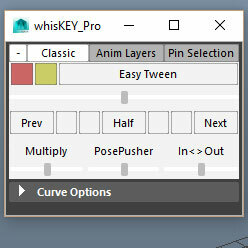 Easy Tween This button will set an inbetween key on your selected objects. It will be based on a linear interpolation of the neighboring keys based on your timeline position. Simply put, if you are closer to the previous key, the inbetween will be closer in position to the previous key. If you are half way between two keys, it will be a 50/50 inbetween. Slide this left and right to set an inbetween key. Its realtime too, so as you move the slider around you will see how its working right away. Some handy presets for setting common inbetween values. Use this slider to multiply a controls values. Sliding to the left will make the values closer to zero (often this is the default position) and sliding to the right will increase the values. ** Ctrl Slide to set Strength, Right click for options. This is a slider to work with overshoots. It will project your animation forward and backwards along how its moving. Really helpful to make poses more extreme, or to have a pose continue along further. The In<>Out slider will move an object(s) towards or away from the camera of the active view. This is actually something thats pretty tricky to do by hand, but very useful. **Note, Please see the documentation on the Classic Widget. 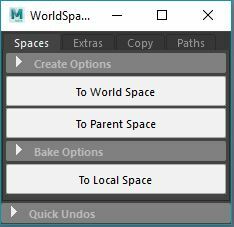 This slider will set inbetweens based on world space positions rather than local positions. 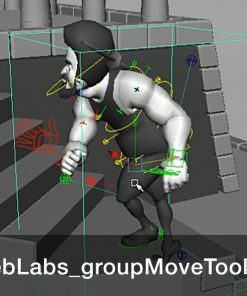 Really helpful for things like fixing foot sliding when your character is animated by a global control, and the walk cycle is ‘in place’. Use this widget to store a pose and apply it somewhere else in your scene. **Note: Right click menu on Capture Pose same as Pin menu. ** Please see Tools documentation below. 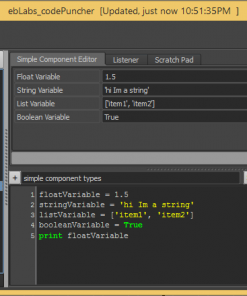 These buttons will set the tangents for the selected objects and will also set the default tangent type for new keys. Its never too late to brush up on your animation principles. 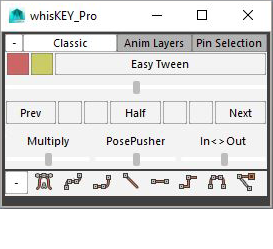 There are any number of ways to customize WhisKEY Pro, here are some ideas! Right Clicking most anywhere in the UI will bring up the Main Menu. Here you can find quick access many of the additional tools and customization features. Check here for some frequently used tools. Also available as a widget. 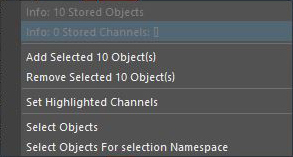 Will go through and rekey the selected objects where there are already keys. This is really helpful during blocking when youd like all of the controls to share the same key times. **Note: Works with Channel Selections as well. Same function as the previous tool, although it will match the key timings to the last object selected. 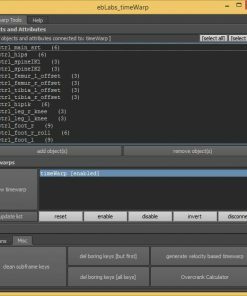 Clean Subframe Keys This will cleanup your animation curves and remove subframe keys, while preserving your animation as closely as possible. Works much more nicely than Maya’s snap tool. This will remove flat sections of unchanging animation. For example, keys on scale where nothing is actually changing. Smash Bake Occasionally Maya’s bake function doesn’t work with complex animation. That’s where Smash Bake comes to the rescue, this will bake out your animation much more reliably. 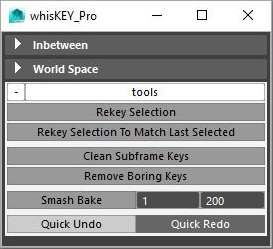 Since the new WhisKEY Pro toolset is so customizable, you may find the need to save multiple arrangements. Use this menu to switch, create and remove profiles. Move the Widget up or down in the list. Click on this menu item, or simply click the button in the top left of each widget to collapse it. Click to add any number of widgets, see below for more info. Remove the widget that was right clicked on. These are mostly for testing, but the Reset Prefs menu option is quite useful when you want to reset your layout back to default. You will need to relaunch WhisKEY Pro after resetting. You will see some common functionality throughout each Widget. Description Area Click on the description and write in your own. This is a great way to keep track of your widgets. Pin Selection Select your objects and click Pin Selection. This will store the selection within the widget. You won’t need to select anything in order to use the widget. Use this menu to made changes to what “Pinned” to the widget. The two items at the top gives you some brief info about whats Pinned. Add Channels to whats Pinned. 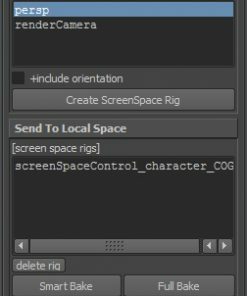 Select Objects for selection namespace, this is helpful for making the same selection on other rigs in your scene. So the Hand widget can work on various other rigs that have the same controls. This tool will continue to grow and collect new widgets. Suggestions and feedback are welcome!